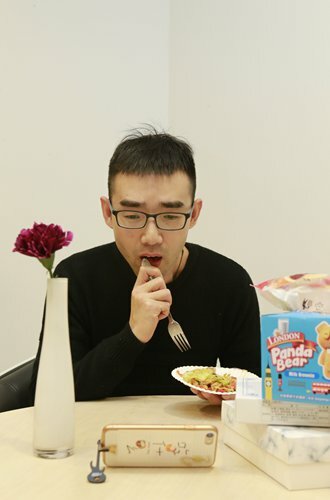 Eating alone used to be a sad story, but with the prosperity of online videos and dramas, it is not the case anymore. During meal times, more and more young people open their cellphones, choose a favorite show, and eat while staring at the glowing screen and burst into laughter now and then. Li Yujia, a 19-year-old student studying at the University of International Business and Economics in Beijing, is one of them. A foodie and a video lover, she is happy to eat while watching food programs on her laptop or cellphone. A show she has been recently watching is about two Chinese girls traveling around Japan to find delicacy, and the recent episode of the show has been viewed more than 26,000 times on China's top microblog platform Sina Weibo. "I love Japan and Japanese food, and the show contains rich content ranging from selecting and purchasing raw materials for cooking in a high-end restaurant. In addition, through elaborate shooting, the food looks more attractive," Li told Metropolitan about the reason she loves the show. Besides this show, she also watched many online food programs. "I found that if I don't eat something when watching these shows, I will end up feeling very hungry. So I prefer to watch them during meals," she said. For Wang Keyi, a 26-year-old woman working in a music company in Shanghai, watching an episode of an online drama or program proves relaxing during lunch time. Recently she fell in love with the hot broadcast Chinese food documentary Once Upon a Bite, and usually watches it in bed before she goes to sleep. "I tried to watch it during lunch, but there are so many things I don't want to ignore, so I found myself rewinding the show all the time," Wang said. "However, it's a torture for a foodie like me to watch it at night because I'll feel starving with nothing to eat. Then I cannot help opening some food delivery app or online shopping platforms like Taobao." She's got a point. People's passion for food programs or cooking shows can quickly transform into sales volume for online stores. Consider A Bite of China 3, for example. After the episode introduced a handmade iron pot from Zhangqiu, a small district in China's Jinan, Shandong Province, all the pots on Taobao were quickly sold out in one night, and customers who want to get a handmade Zhangqiu pot have to wait for several months or even a year, Entertainment Industry, a We Media focusing on entertainment industry, reported on November 1. The same thing happened during the debut of Once Upon A Bite. After its first episode was broadcasted on both TV and the Internet, many online shops on Taobao began to sell the same food appearing in the documentary: ham from East China's Anhui Province, smoked horse meat from the Xinjiang Uyghur Autonomous Region, and the crab roe sauce from Suzhou, Jiangsu Province. Many online shops have sold volumes of more than 1,000. "It's not unexpected," said Adrien Niclot from France, who has been living in Beijing for seven years and is a huge fan of Chinese food. "China and France share the same craze for food. We both love cooking and eating, and we have a long catering culture history. So people must be very fascinated by food and related programs." "In France, we also have food reality shows, like Masterchef and Top Chef. Ordinary people can cook like a master chef, and then they compete in the show. It's both a competition and entertainment," Niclot said. Irina Korovina from Russia also loves Chinese food programs very much. She watched a reality show with friends, in which some Chinese stars cooked seafood and crabs. "My Chinese friend recommended [the show] to me, and I was attracted to it at first sight. They cooked the seafood differently from us, but I was fascinated by the lively atmosphere, and the dish they made looked very delicious too," said Korovina. Exquisite pictures, finger-licking food and cuisines, abundant culture and touching stories, and the participation of stars - are the elements that make food programs a perfect meal companion for younger Chinese people, even when they are far away from home. "After I left China and started my life in the Netherlands, I found myself always watching A Bite of China during supper," Yang Manling, a student studying international political economy in the Netherlands, said. She added that she has only been living there for two months and she has already missed the home flavor of China. "For me, Chinese flavors are like the comfort zone that gives me a sense of safety," Yang said. "Living in a foreign city, I want to find something familiar and comforting. For me, that is food."